Hanukkah is a festival about a miracle: a vessel of oil for the Jewish Temple menorah that was supposed to last one day ended up burning for eight. 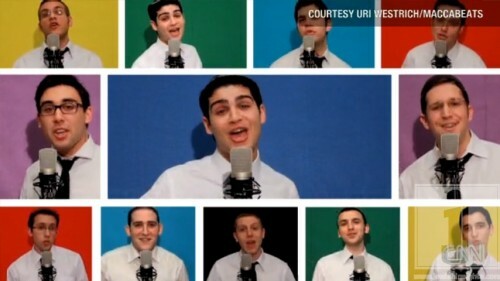 So it is entirely fitting that on this Internet-age Hanukkah, a video about the holiday performed to a hip-hop beat by an obscure a cappella group made up of yarmulke-wearing Yeshiva University students and graduates has stretched into a YouTube sensation. In 10 days, they have had more than 2 million hits (there are only 6 million Jews in the United States), have appeared on “The Early Show,” and have had their video shown on “Today” and aired on radio stations Z100 and WPLJ. They are also being seriously wooed by a CD label. Scores of comments have been posted by Jews who pledged to light menorahs after years of forgoing the ritual and non-Jews who seemed on the threshold of converting. The four-year-old group, known as the Maccabeats (after the Yeshiva University sports teams, not the heroes of Hanukkah), has done a few bar mitzvahs, weddings and small concerts. Their only CD sold in the 5,000 range. Its members are too busy studying for professions like law and the rabbinate to do more. Mr. Shalev mentally converted that to “I flip my latkes in the air sometimes, singing ay-oh,” and a song called “Candlelight” instead of “Dynamite” was born, penned with the help of member David Block. Almost as quick as a spin of the dreidel, he envisioned a video with friends flipping potato latkes out of a frying pan, lighting a menorah and fighting the historic Maccabees’s enemies. The video was filmed and edited, with multiple screens, by Uri Westrich, a medical student. Group members shot outdoor battle scenes in Fort Tryon Park with the Cloisters in the background, looking suspiciously but, Mr. Shalev insists, unintentionally like the Second Temple. Mr. Shalev is pleased that the group has made listeners happy, but he also suggests the group may have performed a mitzvah, a good religious deed. “One of the central components of Hanukkah is to publicize the miracle that happened,” he said. Well, Hanukkah has three more days.